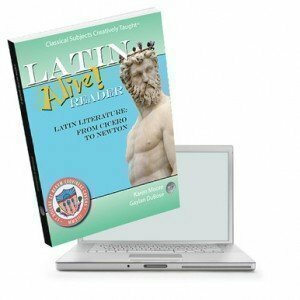 Students having successfully completed the equivalent of Latin 1–3 are eligible to enroll in Latin 4. In Latin 4, students will apply their Latin knowledge and skills to the task of translating longer passages using Latin Alive! Reader. Students spend most of their time reading and translating original Latin works that span the centuries, from Cicero’s Art of Friendship to Latin ecclesiastical writers (such as Augustine) to historians (such as Bede) to monarchs (such as Queen Elizabeth) to scientists (such as Isaac Newton). This course also incorporates lessons on original Latin poetry and provides historical information about Latin poets. This course is designed for students who have successfully completed our Latin 3 course, or an equivalent course of study.